Do you hurry past mirrors because when you look into your own eyes, you see someone who looks a lot older than the how you feel inside? 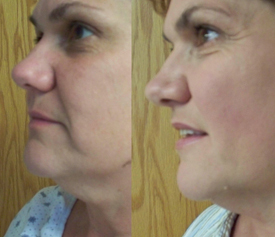 There’s only so long you can run away before you face the stress lines, sagging jowls and neck, and a face that looks like it’s weathered five years in the past one. Natural aging, right? Nothing you can do about it without chemicals, poison injections, or costly plastic surgery? Regardless of what plastic surgeons and face clinicians might tell you, there really are proven methods that will make you want to stop in front of that mirror – without any of the dangers of pain, bruising, or clearing out your life savings from making such “corrections”! Four years ago, at a conference in California, we discovered a successful, safe, and non-invasive treatment system that fits that bill, and I have since integrated it into my acupuncture practice. It’s a skin rejuvenation process that is administered via micro-current and radio-wave energy. This system of care was researched and developed by Professor Charles McWilliams, ND, a world-famous naturopathic physician, who has used it successfully in Europe for 25 years (even though it’s only been offered in the United States since 2005). Second, radio-wave energy immediately begins the rejuvenation of collagen and elastin at the cellular level, several layers beneath the surface. Your result: The skin is lifted immediately due to the waves lifting and toning the musculature of the face and body, while your body starts collagen and elastin production. You can physically measure the difference right after your treatment (we actually use a ruler) – and in two to three days, when the cellular changes make it to the surface, you really look fabulous and glowing! Once the treatment is completed, only minimal maintenance treatments are necessary – and the results can last three to five years. This procedure is different from many of the self-use devices sold on late-night TV! Though there may be some short-term, topical improvement via use of those machines, they only reach the top layers of the skin, without the additional benefit of the first detoxifying first step and the additional incorporation of the other senses. This just provides nominal (if any) visual improvement that typically disappears almost immediately. So, come and try our proven skin rejuvenation method… so you’ll want to stop in front of that mirror when you pass by! See our Skin Rejuvenation FAQs page for more information.